Ground-based fire detection is defined as a terrestrial monitoring system for wildland fire detection and prevention. Manned watchtowers are the most established method for the spotting of wildland fires. They have been employed for centuries and are still in use in many places around the world. There, fire detection is done with the naked eye and requires a vast expenditure of manpower. Observers tend to spot first smoke and only much later, or in case of fires very near to the observation point, flames (in this entry the term “fire” is used to refer to an event in which both flame and smoke may be present). With the advances in camera technology and in computational power, different remote sensing fire detection technologies have been developed in recent years to assist and replace human observers. Camera-based monitoring systems, commonly installed on watchtowers, cover a wider area than human observer. One important element of these technologies is optical detector, such as visible range sensors, infrared sensors, light detection and ranging (LIDAR) equipment, and thermal imaging sensors. These detector systems can be ground-based, airborne, or mounted on satellites, depending on the operative requirements. Based on user applications and specifications, one or multiple combination of detectors using different wavelengths can be deployed to create a surveillance system. Optical detectors in ground fire detection systems involve a number of observation units, which are installed at a site. Depending on the observation area, the optical detector can be in stare or scan modus. Imaging techniques are then applied to detect potential fire. Imaging techniques are the processing unit of the fire detection technologies, with the task of extracting information from the images and, ultimately, of detecting fires. Plenty of algorithms are available in research for early fire detection, fire propagation, and postfire analysis, which can be implemented as automatic or semiautomatic solutions. The majority of these image-based techniques, for ground-based fire detection, search the images for smoke traces (as opposed to flames) and allow the discovery of a fire as soon as its smoke signature is visible, enabling a prompt intervention and an easy extinction. Since the effectiveness of any fire detection system is measured by its speed in reporting a fire to the authorities, image-based fire detection systems prioritize early stage fire detection reliability and real-time performance. Ground fire detection can be categorized in various manners, depending on the spectral ranges, from visible up to the far-infrared range. To build a reliable detection algorithm, one way is to combine different spectral channels and determine the spectral analysis of different surfaces to detect more fire features. Optical sensors, from visible to thermal infrared wavelengths, are widely used, especially if it is possible to combine image data from several wavelengths, since this practice tends to increase the detection reliability. At visible wavelength, near-infrared (NIR) and shortwave infrared (SWIR), the radiant emission is very much reduced, although some visible wavelength emission can be and is observed, especially when the environment is not too bright (e.g., flames at night). NIR sensors are widely used in ecology and vegetation monitoring. They carry the most information about the vegetated surfaces, so the health of the vegetation and its “greenness” can be clustered using the information in NIR band. The fire detection algorithms during the night use the data in NIR range, by looking for light of the flames. Disturbances, such as flashlights and moving objects, are eliminated by appropriate filters. The SWIR band is commonly used to give information about the humidity of the soil. This information can be considered in fire risk analysis. Additionally, information about the location and propagation of wildfire can be retrieved by using SWIR band. Since smoke is transparent in this band, the active burning areas under the smoke are detectable. A combination of two or more bands is used in sensor technologies to detect and monitor the burned areas. Observing wildland fires, flame is not always visible and can be hidden under trees and bushes in the early stages of the fire. So smoke is considered as the main visible signal for the early detection of wildland fires, with the exception of particular environmental conditions (e.g., at night). There are some common features in flame and smoke events, but smoke lacks of chromatic values and is transparent at SWIR and NIR wavelength ranges. 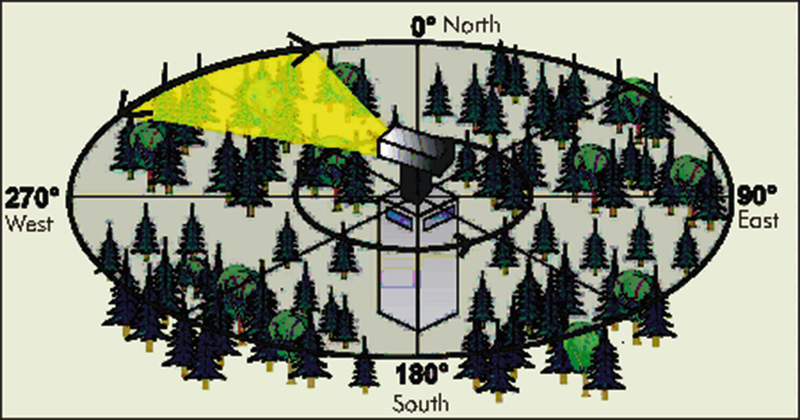 Detectors in ground-based systems are installed on observation units, which need to be properly located, to give the maximum visibility of the observed area. Since this area is fixed, this kind of system is usually applied for high-risk or high-value areas. A round-the-clock, real-time surveillance of such a defined area is possible using ground-based systems. Figure 1 shows an example of such systems. Images are acquired by one or more optical sensors scanning the target area. 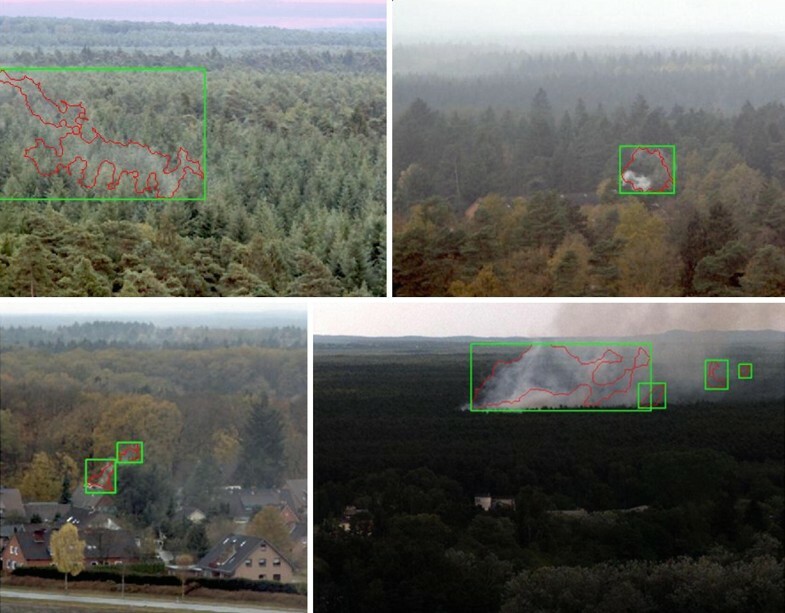 Image processing algorithm detects fire-generated smoke clouds in the received images, and the final result is transmitted through a communication network to a central station. Depending on the type of sensor, the system can be used day and night. Considering the local topography of the surveillance area, the sensor type and the atmospheric conditions, the detection distance of smoke can reach up to 20 km in good circumstances. Ground-based platform systems are mainly mounted on fixed watchtowers, installed at different heights. The location and height of the tower are critical, based on the topography of the observed area, and need to be selected precisely by territory analysis. The number of installation sites varies, depending on the size and the topography of the area. Fix installation has the advantage of permanent surveillance of the high-risk areas. However, flexible and rapid observation of the fire source is not possible using such systems. A high-resolution imagery and real-time fire detection are feasible with ground-based system. The image processing unit works with a variety of excising image techniques in classifying fire and non-fire incidences. Computational cost and scene complexity play a key role in developing different algorithms. Considering the visible light sensors, most of the electromagnetic radiation is reflected light in visible range, and the flame signature is stronger in NIR and SWIR spectrum (Allison et al. 2016). Fire detection algorithms, in visible light, use the color properties of flame pixels as a decision factor. Color features of flame pixels are examined and assigned based on empirical analysis of different flame images regarding temperature changes and environmental conditions. A single model cannot be applied to all environmental and seasonal conditions. A reliable image processing technique is mostly based on a combination of different fire features. Many image techniques combine the visualization of fire properties with some extra features such as motion, flicker, and transparency. One of the important dynamic features of fire is motion. Using temporal information, a change detection method applies temporal analysis on video frames in a time interval. A very primitive method in image processing is threshold method, which is simple with low computational cost. However, the environment changing factor is not considered. Other techniques have been developed observing intensity changes, background subtraction, Gaussian combination, or automatic classification methods (Qian et al. 2009; Yoon and Min 2013; Stula et al. 2012; Arrue et al. 2000). Shape variation and flickering effect of fire pixels can be analyzed over time in video frames. Background subtraction is based on a simple model of extracting foreground pixels as region of interests (ROIs) and labels them as moving objects. A simple method is frame differencing in a sequence of frames (Patel and Tiwari 2012). In outdoor conditions, a more reliable method to extract background image is Gaussian mixture model. The variable distribution of a pixel in the frame sequence is modelled as a multiple Gaussian distribution. Considering the pixel changes, a background model is built and used as a model to be compared with any new frame (Wren et al. 1997). All these techniques are applicable for both visible range and near-infrared spectra. For daytime, smoke is the most reliable signal for early detection of wildland fires (Allison et al. 2016). Advance video smoke detection algorithm is developed using optical imaging. Considering the visible range of spectrum, the chromatic analysis of smoke deals with different shades of gray. A number of rules can be defined to set a threshold and extract smoke pixels. Combining temporal, spatial, and spectral information of fire as features, ROIs are extracted as a region with the highest probability of having fire pixels. Furthermore, a validation process classifies real fire events. Experimental results of a forest fire detection algorithm, analyzing the chromatic and the dynamic characteristic of fire events, are shown in Fig. 2. In wildfires, smoke events are of varied size and transparency. Hence, the process of decision-making about the potential fire events is complex. In addition, some main sources of false alarm are haze, fog, and cloud shadows, increasing the difficulty to distinguish smoke events. The false alarm reduction (FAR) system proposes a real-time infrared-visual system by using meteorological sensors and geographical information and by applying neural networks and rule-based systems to increase the reliability of wildland fire detections. The FAR system, applied on different experimental scenarios considering solar illumination, indicates a huge decrease in the false alarm rate (Arrue et al. 2000). False alarms can be reduced by applying post-processing units like meteorological data and use of digital elevation model to estimate the distance of the fire spot. Image processing units tend to create false-positive alarms due to the changes in local contrast and brightness, which is influenced by the distance information. The combination of various parts of the electromagnetic spectrum, as in multispectral and/or hyperspectral sensor units, increases the likelihood of correct extraction of smoke event. During the night the visibility of smoke is not a detection criterion in visible range sensors. Video wildland fire detection relies on the light emitted through the fire at night. Proper sensors in low visible range and NIR need to be applied for nighttime detection. Nonvisual sensor systems in ground-based fire detection are mostly based on infrared spectrum and sense the heat flux from fire source. Since those nonvisual sensor systems rely on received heat, smoke cannot be detected, and a possible delay may happen if the source is too far from the sensor. Besides the optical imaging techniques for smoke detection, LIDAR measurements with single wavelength at 532 nm have been applied to sense smoke in an experimental forest fire in Portugal (Utkin et al. 2003). An early detection of forest fire is achieved within a defined distance range. Concentration of smoke particles and the distance to the smoke plum are critical factors for reliable detection. However, the LIDAR apparatus is not eye safe, and the automatic recognition of smoke needs to be developed. Uncertainty in final classification of wildland fire detection algorithms is unavoidable. Scene complexity, natural illumination conditions, atmospheric effects, and many other factors influence the classification performance. A sharp decision is applicable in many scenarios, as long as the environmental conditions are steady. Otherwise, any deviation from the predefined threshold in the decision-making phase may result in a false detection. Handcrafted fuzzy-based systems can improve the performance of the algorithm by applying a soft decision method. A fuzzy-based system is a rule-based function, which evaluates ROIs to classify them into fire and non-fire events (Fig. 3). The reliability of the imaging techniques in wildfire detection is directly connected to the number of fire features in the system. Combination of more fire features increases the efficiency of the detection. In addition, a failure in classification can be used as feedback to the system to be revised and learned. For the purpose of automatic feature extraction and classification, artificial neural network (ANN) with back propagation learning algorithm can be used. In image classification and object recognition challenges, one common method is convolutional neural network (CNN), which is inspired by visual cortex. Figure 4 shows a simple architecture of CNN for fire detection. The convolutional layers in the early stage extract elementary visual features of the image such as edges and corners. Deeper layers are for the higher level and complicated feature extraction (Hijazi et al. 2015). At the output layer, a prediction is given, and the image is classified into smoke or non-smoke event. Using ground truth, the decision is verified, and the system learns by iteration to distinguish smoke events with higher efficiency. Hijazi S, Kumar R, Rowen C (2015) Using convolutional neural networks for image recognition. Technical Report, 2015. Available: http://ip.cadence.com/uploads/901/cnn-wp-pdf.